Home Building is Team Building! Working on a Habitat home is a fantastic and meaningful team-building experience. Groups can commit to a single day of building, or may wish to join us on site once a month or more! We also have week-long building opportunities for out-of-town groups as well as group opportunities at our ReStore. We can accommodate groups of 10-12 people. Larger groups can serve across multiple days or at multiple build sites. Please fill out our Group Volunteer Request and we will reply with options and availability. to learn more about current construction projects and options for your team. Corporations, businesses, religious institutions, and community groups that partner with St. Vrain Valley are helping to build stronger communities by sponsoring the construction and critical repairs of homes. 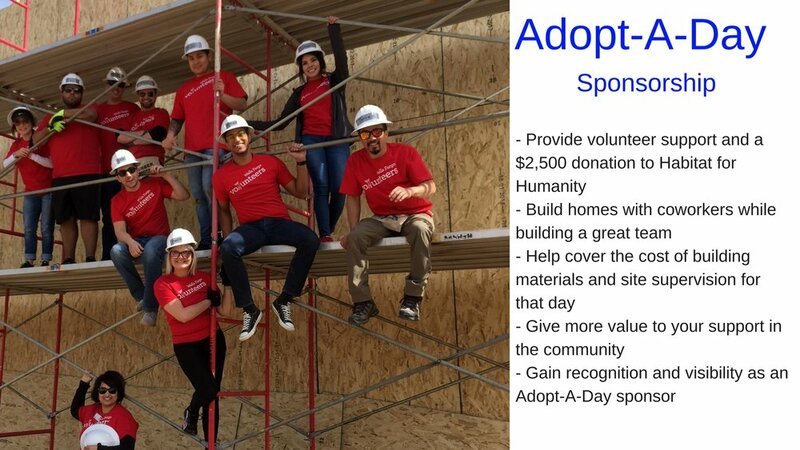 By partnering, your organization will provide your employees/members with an enriching, team-building experience while also providing a crucial services and resources to low-income families. For more information, please visit our Corporate Sponsorship page. We are happy to accommodate business, church, school, senior citizen and retirement, and other large groups at the Longmont ReStore. ReStore volunteers help us move more merchandise and keep our store clean and organized so we can make more money to build more homes. For more information, please visit our ReStore Volunteer page. Volunteer shifts available in 3-hour shifts, 4-hour, or 6-hour shifts Monday through Saturday. Average group size is 10-15. Please call us if you have any questions or would like to bring more people in your group size. Contact Hannah Williams for group inquires for the ReStore at (303) 776-3334 x203 or hwilliams@stvrainhabitat.org.